"At age 26 Franz Sedelmayer went to St. Petersburg Russia where he built a successful police supply and training company. One of his biggest supporters was St. Petersburg's young deputy mayor, Vladimir Putin. Putin and Franz bonded and Putin became one of Franz's biggest supporters. But when Franz's company was expropriated by President Boris Yeltsin, Putin did nothing to help his friend. Franz sued for damages. He won, but Russia--and its new President, Vladimir Putin--refused to pay. But Franz persevered, and he won: he foreclosed on Russian properties in Europe. Incredibly, Franz is the only individual ever to collect money from Vladimir Putin's Russia." So, my question is: When Volodya finally leaves power, will those filthy-rich friends, associates and co- conspirators give him back any of those billions? 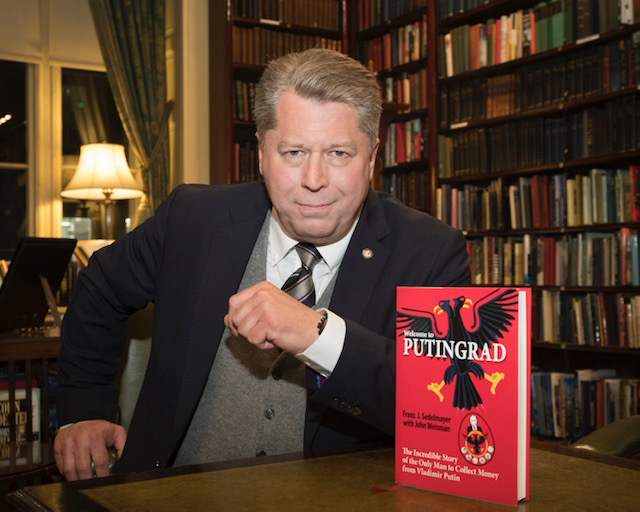 Franz J. Sedelmayer is the author of “Welcome to Putingrad,” the memoir of his years as an entrepreneur in Russia and his legal case against President Vladimir Putin and the Russian Federation. He has contributed to the New York Times and the Transnational Dispute Management Journal. His lawsuit, Sedelmayer vs. Russian Federation is case law on the subject of asset recovery. He is a subject matter expert on international investment, risk and dispute management, global enforcement of arbitration awards and judgements, investment arbitration, sovereign immunity, money laundering, business intelligence and political risk management. He is a regular speaker at universities, bar associations, law firms, and trade and government agencies ranging from the University of Vienna, the University of Cologne, Utah Valley University, to the International Section of the Florida Bar Association, the Geneva Foreign Lawyers’ Association, Latham & Watkins, to London’s elite Special Forces and East India Clubs, the Offshore Alert Conference and the Cologne Chamber of Commerce and Industry. He has long been the focus of the international media. Starting in 1996 he has been covered by the Wall Street Journal, the New York Times, the Economist, der Spiegel, Süddeutsche Zeitung, Newsweek (Russia), Bild, Reuters and Dow Jones. He has also appeared on BBC, CBS, CNN, RTL, ARD, BR, ZDF, and Russian State Television’s RTR and NTV. Sedelmayer is CEO of the US-based MARC LLC (Multinational Asset Recovery Company), which specializes in international dispute management and world-wide claim recovery services. He also serves as trustee, director, and consultant for companies and individuals involved in litigation and claim recovery against sovereigns, state-owned enterprises, and other foreign debtors. He was educated at the Munich International School, attended the University of Utah, and served in the German armed forces (airborne and signaling). In 1989 he moved to Russia and became a pioneering entrepreneur, forming the joint venture “Kamenny Ostrov Company JSC” with the USSR Ministry of Interior’s Leningrad City and Regional Police Department to supply law enforcement equipment. He enjoyed a good working relationship with the then deputy mayor, Vladimir Putin, which included his building, equipping and training the FSB SWAT team “GRAD” pro bono for the Goodwill Games. During his time in Saint Petersburg he was a founder of the Saint Petersburg International Business Association (SPIBA), served as an advisor to the Kazakh government, the Leningrad Region Governor, the Ministry of Federal Security (FSB), the Russian Presidential Guard Service, and the Leningrad Police Department. In 1996 President Boris Yeltsin nationalized Mr. Sedelmayer’s Russian holdings. Russia refused to compensate him and so he pursued his claim through ad hoc arbitration in Sweden under the German-Russian bilateral investment treaty. “Sedelmayer vs. Russian Federation” resulted in the first international arbitration award against Russia. Mr. Sedelmayer prevailed in proceedings against the Russian Federation in dozens of cases brought before European public court and arbitration tribunals, proceedings that spanned more than a decade. He is an authority on the rise of Vladimir Putin, Russia and its descent into a Kremlin-sponsored kleptocracy, and the lengths to which the West will have to go in order to contain current day Russia and its gangster-driven leadership.